Introducing the Mica Collection. Laser cut chrome frame accented by crystal inlays and drops. Add this bathbar to your home or office. Only available from Eurofase. Introducing the Relic Collection. Mirrored vanity light with chrome and crystal. Add this bathbar to your home or office. Only available from Eurofase. Introducing the Wasaga Collection. Three tone draped metal chains with chrome body. Add this bathbar to your home or office. Only available from Eurofase. This vanity light will update your home with its eye-catching design. 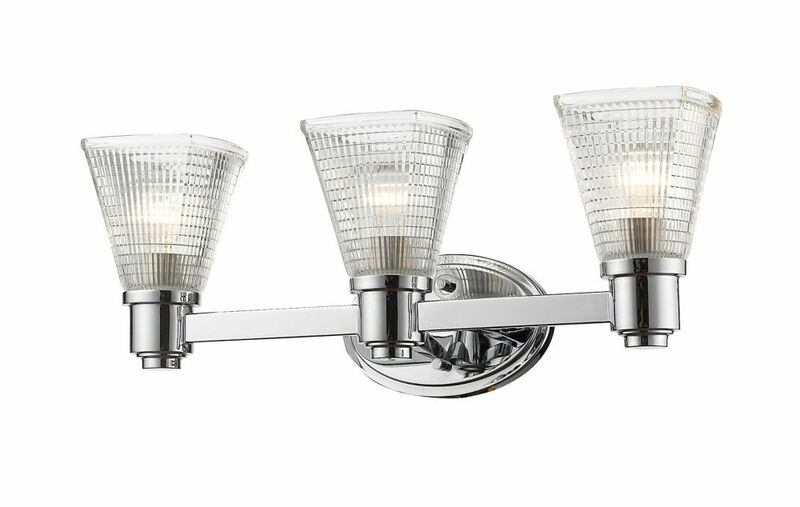 Featuring a polished nickel finish and polished nickel shade(s), this fixture will accommodate a variety of dicor styles. With its easy installation and low upkeep requirements, this vanity light will not disappoint. 3-Light Chrome Vanity with Clear Glass - 7 inch This vanity light will update your home with its eye-catching design. Featuring a chrome finish and clear shade(s), this fixture will accommodate a variety of dicor styles. With its easy installation and low upkeep requirements, this vanity light will not disappoint.